This week Sinopec disclosed the latest hedging mishap, losing $690 million amid last year’s oil price collapse. Unless price risk management is organized as an integral part of core business operations, it can devolve into eratic and risky game of speculation that can cause massive damage. The six simple but important guiding principles could help commodity firms create a world class risk management process and turn price risk into a source of value and competitive advantage. This week Sinopec disclosed that it had incurred $690 million in losses in the fourth quarter of 2018. The losses were attributed to Unipec’s oil hedging bets. Unipec clearly took the wrong directional exposure to oil prices in the period when they staged a sharp, 40% collapse (October-December 2018). This much is understandable. However, such losses did not need to happen – I maintained heavy exposure to oil prices over the same period and not only avoided heavy losses but actually generated significant profits by simply adhering to a systematic trend-following model. As I detailed here, systematic trend following enables nimble navigation of market price roller-coasters, eliminating rogue trader risk and removing human error. Trend following models respond to market price fluctuations as they unfold, without distraction, without emotion and without strong convictions that could ultimately turn out wrong (always a costly discovery). Unipec’s hedging mishap is only the last in a long series of incidents underscoring the fact that commodity firms ought to take their hedging operations seriously and seek to develop them following best practices in price risk management. Price risk management should be integrated with the firm’s overall business operation and make part of the firm’s business strategy. Otherwise, hedging risks to turn into a dangerous game of speculation which, in many cases, has spun out of control causing massive damage. A purposeful, effective approach to managing price risk requires an adequate organizational framework. For any organization, the questions of what risks are taken, in what measure, and how they are managed are strategic questions and should be decided at the board level. The implementation of these decisions should be owned by the firm’s CEO. Managing commodity price, currency, or interest rate risk should enable a firm to take risks in a controlled and purposeful fashion, accept occasional losses and communicate such losses to its stakeholders openly and transparently, without losing stakeholder confidence in the validity of the firm’s strategic choices or the management’s capability to achieve them. Without clarity and guidance from the company’s board and the CEO, the firm may be vulnerable to serious risk-related disruptions, or failure to take advantage of favorable market events. Running a formal audit of key areas of risk exposure – by business unit and by risk category – should form the foundation of a firm’s risk management process. For each category of risk, alternative instruments and methods of risk management should be identified and their respective advantages and disadvantages thoroughly examined and documented. Having evaluated the pros and cons of the available alternatives, management can formulate specific objectives and strategies to be implemented in achieving those objectives. Definitive risk management strategies should set forth the company’s risk management methods and its appetite for risk. It should also set out the responsibilities for risk management throughout the organization. At that point, management should anticipate the necessary organizational adjustments, training and staffing requirements and it should undertake a thorough documentation of the management process, controls, restrictions and paperwork flow. The best part about developing an effective price hedging process is that firms do not need to bet the proverbial ranch on it. At first, firms can apply their new risk management process only to a smaller portion of their risk exposure – say, 5% or 10% of their hedge book – and add to that in subsequent periods as the firm, its staff and stakeholders grow more familiar and comfortable with the process and its impact on the firm’s performance. Finally, the whole solution, once implemented will almost certainly need adjustments and maintenance. Constant monitoring and periodic reviews must remain an integral part of a firm’s risk management strategy. For this purpose, firms should establish an independent middle office staffed with a team of highly skilled risk professionals who regularly report on exposure and risk issues directly to senior management and the CEO. The challenge of developing and implementing this business process should be no more difficult than that of developing any other business project. For this to happen, the communications aspect of the project within the organization may be as important as its operational execution: all parties involved should be offered the opportunity to question and understand the process and be periodically kept informed about its progress and results. While the challenges involved aren’t slight, the objectives and their potential should go far to kindle managers’ entrepreneurial spirits and be well worth their efforts. Alex Krainer has actively traded commodities, FX and treasury and equity futures since 1996 and managed hedge funds based on his proprietary trend-following model. Over a six-year period, from 2007 to 2013 he has outperformed Dow Jones Blue Chip index of Managed Futures Funds (track record audited by KPMG). 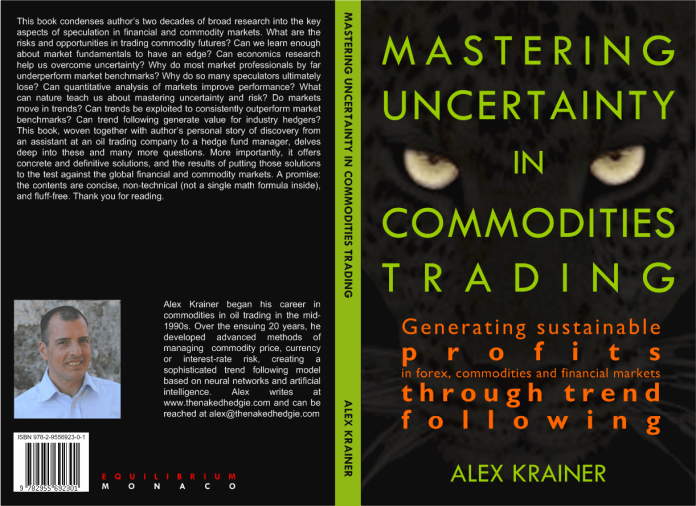 In 2015 he published “Mastering Uncertainty in Commodities Trading” that condenses his 20+ years of deep research into the problem of market speculation.